Here's my card for the current sketch at Freshly Made Sketches. 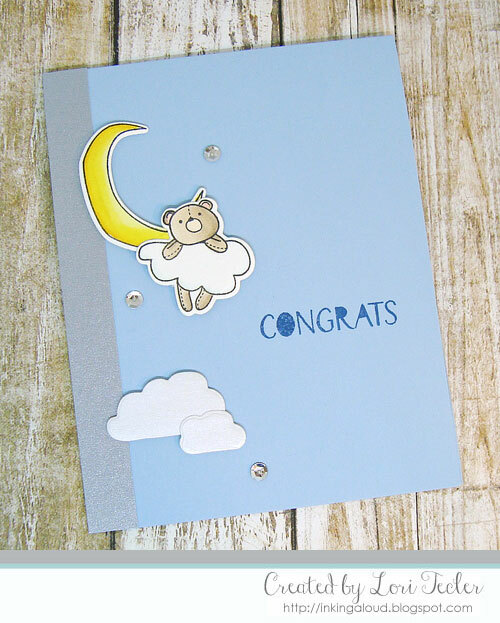 I used the layout to create a sweet baby card with stamps from WPlus9. My images are from the Little Dreamers set. I stamped the moon and bear images with black ink, colored them with Copic markers, then used the matching dies to cut out the colored images. I arranged them on a light blue card base with a strip of shimmery silver cardstock along the left edge, using foam tape for dimension. The clouds at the bottom of the card were die cut from shimmery white cardstock, then adhered with more foam tape. I stamped the "congrats" sentiment from the coordinating Stardust stamp set betwen the clusters of elements, then accented them with a trio of silver sequins. This is s sweet as can be! Cute baby card! Glad you joined us at FMS! What a sweet baby card! I love the cute images and how you've made them work with the sketch. Thanks for joining us at Freshly Made Sketches this week!